Mike Crowley is the founder of 94Fifty.com, a company that produces sensor basketballs and is perhaps the coolest technology that I’ve seen come out in a long time. Here’s a video below of how his product works. In this podcast, you’ll learn how Mike developed this product and how he leveraged Kickstarter to generate massive buzz. Enjoy! Now if you enjoy this podcast please leave me a review on iTunes, and enter my podcast contest where I’m giving away free one on one business consults every single month. For more information, go to www.mywifequitherjob.com/contest. And if you are interested in starting your own online business, be sure to sign up for my free six day mini course where I’ll show you how my wife and I managed to make over 100k in profit in our first year of business. Go to www.mywifequitherjob.com for more information. Now onto the show. Steve: Welcome to the My Wife Quit Her Job podcast. Today I’m thrilled to have a very special guest on the show Mike Crowley. 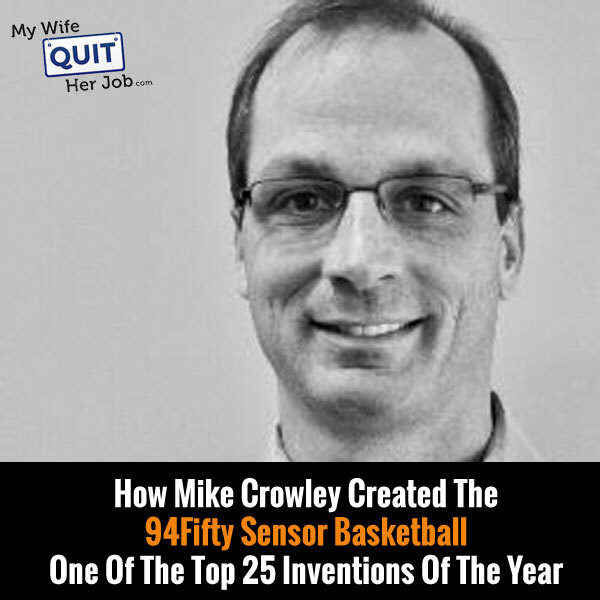 Now Mike is the founder and CEO of 94fifty.com which is a company that creates freakishly smart sensor basketballs. Now here’s how they work, embedded in each 94fifty ball are a bunch of sensors that are programmed to measure things that you can’t really see with the human eye. So things like how the ball spins, how it leaves your hand, how you dribble, and then along with a phone app it helps you train to become a better basketball player. Now since this is an audio podcast and I can’t really adequately express in words how cool these basketballs are, I’m going to link up to the demo video in the show notes so you can check it out yourself. Now mike is actually the first person that I’ve had on the show that has had a successful kick starter campaign, and he managed to raise over $130,000 in 30 days. Now before we start I just want to let the listeners know that I’m currently in negotiations with Mike to make this technology exclusive to Asians, so that we can have more Jeremy Lin in the NBA, and with that welcome to show Mike. How are you doing today? Mike: Good Steve thanks for having me. Steve: So can you give us the quick background story, tell us how you came up with the idea for 94fifty? Mike: Well sure the– I’m from Indiana, so that’s the very first and probably most important thing. We’ve known to play the game a little bit in that state, and like many others it’s the one sport that I had a passion for since probably I was one or two. So that I was predispositioned to basketball and I knew the game very well. I’ve been taught the game by many great coaches, but over the last maybe 10 or 15 years you can see that there was this shift in the way that players were learning not just this game but just sports in general. The younger athletes because they had been so exposed to not only the internet, but mobile devices and the instantaneous nature of information and expectation for results, you could see that there is a difference in the way that they were learning, or their the need for learning particularly very complex motions that are boring to practice. So we took that basic concept. How can we address that need? We talked to a lot of coaches, players, parents and there’s clearly a need for it and develop something that worked in the exact same way that people were used to. So it had to be invisible from a tech standpoint but gave this experience to the player where they could get that instant feedback about whether or not they are doing something right. So that we could turn any parent whether they knew anything about the game and they were pretty elite coach, and then gave that 24 hour access to hey if I want to get better and I want to see an improvement in my confidence on the court or in other case in other sports that they can have access to it in an affordable way. So that’s really the evidence for where the business started and then from there to try to build that product into that initial vision was really the challenge, but that I came– started in Indiana and then carried right through to the modern day tech world. Steve: And you played in college as well, right? Mike: I’ve got my feel all the way through college ranks. Steve: Yeah and did you– have you coached at all before or is this just a passion of yours in general? Mike: You know I haven’t coached at the team level. I went into the business world after school and stayed there, but I’ve trained many-many kids over the years hundreds and hundreds, how to play, how to shoot. So I have a pretty good feel for what it takes to be a trainer, but no I did not have any formal coaching. Steve: Okay and I thought I just ask you know are you a technical guy at all? Mike: I only pretend to be one on podcasts like this, no I’ve got a business background, I just surround myself with a lot of very smart technical people. Mike: And it makes a great combination for the business. Steve: Yes I was going to ask you something. So I’m a hardware engineer with a background into software and I’m fairly confident that I could take a reasonable stab at creating the guts of a sensor ball with some algorithm help, but to create a product like this requires a combination of everything including mechanical design hardware design, as well as you I design. So how does one kind of execute on such a complicated product from the beginning, so how did you get started with def process and assemble the team? Mike: But from that then you had to go out and find somebody who is very good at assimilating all of that technology into a full system. You know a product and it just so happens that one of the guys I grew up with my little town in Indiana who was my college roommate was one of the world’s best people doing it. He started you know working on internet stuff back in the early 90s and has done some amazing simulations of technology over the years. And he was working for Accenture bringing Bluetooth products out to market. We brought him into the company a few years ago and said help us do this with Bluetooth and you know hardware and algorithms and everything else that goes with it, because there are a bunch, it’s very complex. And from that project management experience with the right technical people behind it, you can start to pull together what the guts of it look like. But then at the end of it the real key is to have a really good understanding of your customer and the experiences that you want them to have. Because the tech is just the enabling piece but you’ve got to be able to deliver it in a way that people can understand information they are getting. It’s more than just getting a number to somebody. You have to say here is your number and here’s what you have to do about it to get better, and that’s the real piece that I think we’ve innovated with this that drove the tech requirements, because we wanted to have this experience that as soon as the ball is taken out of the box people can understand right away that it’s different and responsive and it’s there, you know it’s there for them and it’s very accurate. And that was really the whole key to it to bring it together and bring it to life. Steve: So in terms of your initial team who were your core people and what were their competencies when you were putting together the team? Mike: Yeah so we have obviously project management from the tech side. So you have to understand all of the technologies and how to manage that, and then we have the PhD level algorithm hardware assimilator which is the co founder Kevin King. Then we have a lot of embedded system engineers, mechanical engineers, those types of people that can also be multidimensional, but then focus on specific areas of turning this you know all these things to very reliable systems– embedded systems that go into a product. So that when somebody uses it they aren’t going to break and it’s going to turn on every time, and you know all the little things that count to that customer experience. Steve: So in terms of so you live in you said Massachusetts Indiana, was it you grew up in Indiana. Outside of your core team, how did you actually find the engineers and the staff? Like we live out in Silicon Valley and there’s a lot of those embedded system guys out here, but out there I’d imagine there’s a lot less. Mike: You’re not going to get too many to move from Silicon Valley to Ohio, but there’s not a monopoly out there. They’re very plenty of very good talented people across the country. Steve: Okay yeah so you know I wanted to talk kind of about the early stages and your kick starter campaign. So I think I originally found out about you guys– I think it was from tech crunch but I can’t remember but there’s a lot of buzz about your kick starter campaign. So one of my questions was why did you decide to do a kick starter as opposed to other ways of raising money? Mike: Well you know we’ve been successful raising capital, so it wasn’t necessarily a need for raising money that drove our desire to do a kick starter. But we did think because this was on a very early part of our launch plan for the product, for the basketball product, that it was a great way to build awareness and early I guess prototype validation that we’re on the right path. And you know it does get a ton of– you know the media launch is what happens on kick starter. So you know the plan was if we could at least pay for the cost of what it takes to do a kick starter campaign and be committed to it, it’s a great launch plan for the rest of the product and I think that held true. So you know we had $100,000 goal and I think we raised $130,000 which was good, it was good it was solid. What it drove for us was just a ton of early press before we even had a product on the market. It attracted the attention of Apple, and we launched a product in Apple stores that was successful, a bunch of retailers saw it. So it gave that validation in the market, I think that was really our main goal and I think we were very successful in hitting that goal. Steve: So you used your kick starter as a marketing vehicle as opposed to just for purely money raising reasons? Mike: Yeah I think for money raising standpoint if you’re doing a very sophisticated tech product you know to launch it you know you need to be able to raise a couple of million bucks out of a program like that to really have a meaningful impact on the launch of the business. Mike: And we didn’t expect that we would do on the best. I think for us it was part of our launch plan which we could pay for you know through the kick starter funds, and then really help to spring board to the next level where we needed to go from you know early prototypes up to market. I think that was successful because all those early little things that come from kick starter, the awareness, the media coverage, the contacts with the retailers, it helps give confidence to the investor that you do have that you’re on the right path, and get you from point A to actually taking a product to market which is– that’s 20% is the most difficult piece of the equation. And that’s really kick starter has helped you go from the 80% to the 100% mark, and it accelerated that for us. Steve: Okay and then so did you have a working prototype before launching the kick starter? Mike: We did, you know we had reached that prototype stage and I think if you found our kick starter video, you’ll see it working. Those are actually working prototypes that we used in creating that video, but it was far from product ready you know being ready to launch. So we still had quite a bit of work to do to get to where we could put it into the Apple store and be confident it was going to be reliable, and deliver the experience we wanted. Steve: Okay. So at that point you hadn’t had any volume manufacturing, and then this kick starter campaign kind of funded that first run, is that…? Mike: In that sense yes it helped us go from prototype out to market because it does all those other intangible things for you, which is important; it’s an important piece of a thing. I think it’s a rare case where kick starter funds the whole thing. There’s a few stories like that, like the pebbles of the world and a few others, those are the exceptions, they are on the long end of the tail, not [Inaudible] [00:13:04]. Steve: I see that’s interesting, so you would say a lot a lot of these companies going kick starter just to kind of generate the buzz in the marketing? Mike: You know it’s hard for me to say what their intentions are when they go on. I knew what ours were you know so we did not believe because our product was a little narrow. It wasn’t you know a wearable for example where you’d have that many potential customers. So I think we went in realistic. There may be a lot of companies that go in there thinking this is going to– I’m going to you know be the next pebble and they put all of their planning into having that kind of volume. But I think it’s a very risky strategy because kick starter has gotten to a point where it’s not the novelty that it was, it’s much harder to raise that kind of money, and I think you really need to have an alternate plan or at least understand where this fits into your ultimate plan rather than being the sole plan, and I don’t know if other companies go in with that. I suspect that they do and they’re disappointed a lot because there’s a lot of competition in the you know the crowd funding space, and it’s gotten a little stale you know it’s much tougher to hit those numbers anymore. Steve: So I was just thinking if I could get your take on kick starter for raising money versus angel funding versus VCN, kind of what was your thought process in terms of just raising money? Mike: Well raising capital is a full time job whether it’s kick starter, angel or VC you got to know what’s your plan is and it takes a lot of time to get that right. So for example even with kick starter it is a very intensive, it is a time intensive month. The only thing you’re doing for those 30 days is trying to figure out how to get the word out about your kick starter campaign and it just consumes you. But to make it successful you have to spend the two months to three months before that really planning it out to get it done right, and that’s no different then, whether or not you’re doing it with kick starter or Angel or trying to raise VC money. It’s about your plan and how well thought out the time you put in to the though process to be successful with it. So I think kick starter is part of the early funding plan. Mike: Whether you choose to go Angel or VC, that’s really the type of company you have in the market you have and it’s really difficult to make a general statement about it. Mike: But it all requires the same thing as you’ve got to be very well thought out and you have to have tons of validation that you’re on the right path and that’s where success comes from. Steve: Okay. So let’s talk about some of the things that you said about kick starter. You said that first 30 days was very intense. So what were some of the things– so first of all what’s the process involved in creating a kick starter campaign? Mike: Yeah that’s a good question. So the real process is you know you’re going to create a very good video you know a visual for people to understand what you’re doing and tells a good story, and that’s takes a lot of planning. You’ve got to have the right you know team that’s– and not always internal, sometimes you’re going to bring outside help and we did that can help direct the shots and scripts and get everything put together and that takes about a month to do it right, just to get it filmed and edited. And so once the video is ready and towards the end of that the last week you’re applying for the kick starter, you’ve got to get in that information, so it’s just about a week of just prep to get approved by kick starter. Mike: But once it goes live is really where the time intensive work comes to play, and part of the process heading up to that it really helps if you have a really strong social media connection or network because you’re going to rely on the network out of the gate to give it it’s jump it’s pop in the first you know 5-10 hours. Mike: Then the next part of it though and the real grind is day five to days 30 or you know day 28 because you’ve used up your initial network and now you’ve got to go and find new, and it’s just a constant network of social media and social media and more social media and everything you can imagine to bring out the awareness and could build out that viral component to what you are doing where it takes out a life of its own you know other people are talking about it, that’s the whole key to the difference between the very big kick starter campaigns and the ones that push through moderately well. Steve: So let’s dig a little bit deeper so how did you establish that initial social media network for that initial pop? Mike: You know you do it let’s say you’re going to do that six months before you know if you go in with no social media network at all you’re not going to be successful, it’s just too hard. You’ve got to have– this is something that if you’ve got a business that you’ve been working on you should be developing that network all the time. You should be getting lots of followers on Twitter, lots of likes on your Facebook page, if you don’t have them you need them, you should be using Pinterest. You should be in all of the different social media assets that are free and readily available; you need to be developing them. Steve: So what are some of the things that you did to– so what did you focus on; Facebook, Pinterest, was there any one social media platform that you focused on or? Mike: It was mostly Twitter and Facebook for us. Mike: Pinterest at the time we did was vague, but it was a medium we weren’t very confident in using yet. We didn’t know how to leverage that, and so our presence was a lot smaller you know we had a lot because we had a lot of beta stock you know beta products trusting with previous year and half. We had a pretty good email list that we could tap into, you know a lot of contacts in there of different coaches and players and things that could spread the word. Mike: So we leveraged you know we just went it’s kind of old school now, we went email that’s what we focused on. Steve: It’s not old school at all actually yeah everyone relies on it. So you were gathering email addresses from the teams and the players that you were kind of… ? Mike: We had over 25,000 different players that had used our beta product in some way shape or form that we had access to heading into that. So we leveraged that obviously pretty intensively heading into this, but we had we had a pretty good you know starting point of all the assets that we could get out with it well. Steve: So 25,000 is actually a lot of people, so you’re saying that 25,000 people actually tried out your balls prior to the kick starter? Mike: Not these balls. So we had a beta form of the ball, the systems that we would sell, the team so they could use with their groups of players and camps and practices and it was just a very primitive form of this, it wasn’t the Bluetooth version. Mike: But it allowed for a lot of data collection from lots of players because you can run through 100 players in a couple of hours. So we had a bunch of those all over the world, we had 100 of those systems all over the world, that were just constantly collecting information and data for us that help drive the requirements for the new product, but with that we would be collecting information about who these people were and we could go back and talk to them, that was the whole point. Steve: I see, okay so the ball that was going around was not the final polished version, it was more like a data collection device. Mike: Yeah it was a Wi-Fi ball that we’d talked to a dedicated laptop that we would supply with the two balls that we would send out, and it was only for team use, it wasn’t for the consumer, it was for a team. Mike: And when a team would use it, they would technically use it with anywhere from 20-200 players in over the course of a month. Mike: If you get hundreds of those around the world, you’re collecting data and you’re collecting tons of data. Mike: That’s what the whole point of that was. Steve: Okay and then in terms of your Facebook strategy were you buy likes, were you driving ads to your site, how were you generating buzz on Facebook? Mike: You know that really comes down to the quality of your video and your ability to make things go viral, so we didn’t spend any money on buying likes and doing that kind of thing. Mike: We kept our budget to what went into the front end of it, so we spent a lot of time you know it’s the little stuff, it’s the grind. So if somebody likes you on Twitter for example or likes you on Facebook or follows you on Twitter you need to follow them back and then you need to encourage them to retweet and build that network. And so it seems like it’s very Minusha driven you know every like and every follow counts, that’s what it comes down to, you’ve got to be prepared, that’s the grind of that day five through 25. Mike: Mentally you have to be ready for because unless you have a million people you’re coming in with. If you don’t, you feel like everybody else, you’re going to run through that initial network in about five days. Mike: And the whole trick is how do you turn any newcomers into that into somebody who also goes out and shares with somebody else, and that is just I mean it is I call it a grind because that is what it was, you just have to work it and you have to be prepared for that mentally. Steve: Okay. So let’s talk about the grind for a bit. So how did you get some publicity and you know can you kind of describe the grind? What are the things that you were doing just to kind of reach out to people? Mike: Well that’s the other part of it that I haven’t touched on. So one of the other parts of the plan is we did retain some independent PR experts, not a firm but they had a lot of years in PR and we had a little one month contract with them to help us build a buzz about the kick starter campaign and the product. So the other big part of our strategy that was beyond just the social media was we put out there that this product was coming, and in our case the media loved it, I mean they locked on to it very early and they wrote about it extensively. I think we had about 400 articles that were written about it in a one month time period. Mike: So every time one of those articles was written, it expanded our universe immensely. So I’m a big believer in PR if you do it right and if you have the right story and right product. It could be immensely valuable, and it is probably one of the key parts of our strategy even today, where the media really likes this product, it’s a tactile very physical object that people can see or amazed by. So we use that to our advantage. Now I don’t know if every other product is going to have that same potential, but it was hugely important to us as we did it. Steve: Yeah I can completely see that I mean as soon as I watched that first video, I knew your product is very compelling and you had an awesome story. So I can imagine something like that would just naturally generate buzz. I’m sure your PR person had a much easier job with your product than maybe some of their other clients. Mike: Well you know it’s easy when it clicks, if it doesn’t click then you know it’s not so easy but in this case it took on a life of its own. So I talked about the viral nature and what can happen in social media. Our viral uptake was on the media side you know we just got a ton of press and that we did it in March, it was the month of March, and then that press was what generated the awareness to retailers and others and allowed us to carry it forward. And in fact generated a whole another round of PR for us and holiday when we launched, because it had been on kick starter, people were watching it, we were visible now to the world you now they took us seriously. Steve: Okay and then I had to ask this question so in terms of approaching the NBA, did you do that earlier on or was it just after this press wave happened? Mike: Well, approaching the NBA in what way, so what…? Mike: To get validation from the NBA is a whole different animal that I don’t think we want to talk about it really quick in the podcast. I don’t know if this is a good area for it, but to come back to your question is this working with validators in the market, that we think would have an influence in our market and our market is 818. Mike: What we found in our surveys in our studies that we did in building the product is that the college level coaches were far more influential on the normal family, because I think that in our market that it’s for any player that has an aspiration not necessarily to play in college, but they just want to get better and they want to have more confidence. They want to perform a little better and they’re willing to practice and we give them a better way to do that. It’s more responsive et cetera et cetera, but the college voice is more influential to that market, we found that in the NBA voice. So we went out and sought out partnerships with like the national association of basketball coaches, but all the college level coaches and the organization that they’re a part of, and that’s what we use today as more of an influencing factor to validate that what we measure is real and it helps and it’s used by that level and it’s useful. So that’s where we put our focus, it was initially the NBA. Steve: I guess that makes complete sense, your target market is younger kids who are aspiring to become really good players. Steve: So if you can just kind of break down your sales. I’m not going to ask you about numbers but where do you make the majority of your sales today. Is it through the internet? Is it through the Apple Stores? How does the sales strategy play out? Mike: Yeah, so you know for this holiday we started with Apple and they were a dominant provider or distributor for us last year when we launched. We were exclusive in apple and online 94fifty net sales and then partially because that’s all we could produce for last year. Mike: The product wasn’t ready until mid November, so we were even a little late to the party. But this year our strategy has been how do we expand that? So we have run Amazon now which is a big distributor for us in East Bay and Dicks Online, and we try to focus right now. We even have a big retailer up in Canada called Sport Check which is both in store and online. But we– the product is still so different and new. And because it looks like a regular basketball, but it costs a lot more you still have the story have to tell. And we found that telling it through video and giving people more time to understand what they are purchasing and the benefits is best done online. So most of our distribution today is done through online channels through either our own 94fifty.com or partners that can use the assets that we create, and so it’s about 50/50 right now. We do about 50% of our own and 50% of our distributions through partners. And we have a pretty strong international distribution at this point. And we have markets like Asia and China really start to pop for us because they love to play the sport over there. So it’s a pretty good mix and you know we really take our time in evaluating who is going to commit to really helping customers understand the value prop. And it’s not just about stocking it in the store because it is an expensive product to build and you know it’s a whole different animal when you are running a retail, you got to do that right. So we’ve taken a pretty measured approach to how we get distribution out there and how we achieve the you know the production capacity really is our biggest constraint. We can produce so much and we sell so much and that’s it. You know it’s not like we can prop up a million of these tomorrow. It takes time. Steve: Right. I actually I had a couple of questions on your retail strategy. I interviewed someone in the past where they had a very high end product and they put in retail stores, but they weren’t doing an adequate job of pointing out the benefits. Steve: They were sitting here with the product that was very expensive compared to the rest. And so I would imagine you know your basketball looks like all the other basketballs and it feels the same, so in these retail outlets is there like a huge station set up where there is a video and then it can really educate the customer about why they should buy your product? Mike: What we found with retailers in general with the internet of things type products they are starting to think this way, but they really have been caught a little flat footed in that there this wave of products. Not just basketballs but just about everything you can imagine that has the same problem that you have with the smart product. It is designed to look and feel exactly like the product. It isn’t smart because that’s what people– that’s how they know how to use it. But the value prop is totally different because the information you get out of it and it is going to be more expensive. But retailers in general were not prepared for the pace at which these products enter the market including ours. And so they are just now starting to build those strategies is to how we set up these areas within the stores to deliver that value prop in a way that somebody will buy it in a retail setting in volume. And a few companies have figured out that you know like a nest for example and how they get to retail, but the vast majority of them they struggle with how you educate both the employees that need to sell them and the customers that want to buy them. And it’s very time intensive and costly. So our approach has been when we see a retailer who sort of gets it we work with them, but if we feel like it’s pushing a string that the retailers aren’t ready, we just disengage and move on. And because there are other avenues in which ways you can sell these products they are just as effective. But the market is still just I think a tad bit behind and I think you’ll start to see retailers and customers will see retailers really dedicating more space and time to developing the winning smart products strategy probably within the next 12-18 months. Steve: The reason why I asked that question is I think earlier you alluded to the fact that your earlier sales were from the Apple Store, right? Steve: As opposed to focusing more you had limited inventory it sounded like, right? Steve: So the allocation of that it sounds like you allocated a big chunk of the Apple store as opposed to your own online efforts and I was just curious why that was the case? Mike: Well they had 250 stores. Mike: So you know in order to supply that many stores where we started in you know they need to have not only what they put on the shop but they need to have an inventory and they need to have a couple of weeks backlog. So just by the nature of trying to go into that many stores out of the gate, they’re going to get a good chunk of it, but it was you know we reserved the knock that we could adequately supply internally as well. I think we did a pretty good job of broadcasting. If you want to immediately jump into that many stores that sell that much, you’ve got to have product you know be prepared to commit it. Steve: How do you forecast the allocation, or make these estimates? Mike: That’s the best kind of advice I can give there is no magic bullet to it I think. Steve: Okay. So let’s talk a little bit about manufacturing. So you mentioned that earlier that these balls are manufactured overseas. So what is the process of such a complicated product you know you have the ball, the mechanical aspects of it, then you’ve got the you know the circuitry and that sort of thing, so how does that all come together? Mike: Oh wow the– you know when you’re dealing with smart products you’ve got PCBs or circuit boards and all the components. The hardest part about it is you’re carrying the components, you know there’s roughly 70 to 80 different little pieces that go into this and they come from many different vendors, and the thing that’s happening is because there are so many products that are using these same components, it could be the least costly little thing on your PCB, but its n the highest demand and you’re going to get stocked out if you’re going to wait for it. So one of the hardest things to manage is the lead times which you have to allocate to just secure the parts to get it into manufacturing. That can take three months if you start from scratch sometimes four. Mike: So accounting for lead times is very difficult and then you know we’re not doing we’re not– you’re competing with you know the smart phone maker, so you’re not buying in the millions of units a month to start. Mike: So you’re always at the bottom of the totem pole. We did a very good job of managing and really building strong relationships with the big vendors with the key parts so that they liked us and we really helped them with some really cool things with our basketballs that they wanted to do. You know it’s really just a matter of trying to make as many friends as you can so that you can ask for the favor and say I need this part, can you reserve you know 25,000 pieces for us for a run next month, and they will always find a way to help you. But once you get all the parts, then you’ve got to have a very good contract manufacturing relationship, you want to do it as low cost as you can. You’ve got to have all the receipts and contacts now that we looked at both, but the key thing for us is that the inflatables industry which is basketball, soccer ball et cetera, is completely overseas now. That moved over there 30 years ago, so there’s no way we could finish our product unless we did it in China or overseas. Mike: There is just no way, it’s just not in the US anymore. So once that was the case, we just made the decision as you may as well have both of those components done as close together as possible because you eliminate risk of trying to ship things overseas, and trying to get parts here and there and we tried to put it all into a geographic area that was very-very close together, and that was our strategy, and I think it worked, but it’s not the same for everybody. We had a unique situation trying to bring the inflatables and the electronics industry together, that was new. Steve: So in terms– so you did all the PCB design in-house and then you shipped the [inaudible 00:34:22] over to Asia and then you had all the PCBs and everything assembled over there? Mike: Yeah, we do all of the design and engineering here and then the [inaudible 00:34:31] as you said, the files about what they are supposed to produce in their you know from a board perspective, they manage the whole securing the parts and getting it done on the QC and then they work with us on how you get the parts or the work in process or the finished goods or the sensors over to the ball manufacturer and how that’s all going to come together is really a fairly complex process of which we had to build our own apps to do a QC at every point so we could see that the sensors and the balls were being produced right, they weren’t being destroyed and we had to innovate the whole thing, so it was very complex. Steve: That was actually my next question, but first of all how did you find the vendor to make the ball and do the assembly. I imagine it’s more than just finding a regular ball manufacturer right? Mike: Yeah while we used the best factory in the world, they make the NBA ball and you know a lot of other top name top quality balls that you’d see in the market. That came from one of our key hires that we made who came out of one of those companies and build many-many products and sourced them for years. So we had to have that asset internal and those relationships to make it work. So that was just a key hire that we made and it’s been very effective for us. Steve: Okay and then in terms of introducing this new electronic component to the ball that was just something where you had to fly over and just work out with the manufacturers directly. Mike: Yeah, they flew here, so there was a mix and flights back and forth and you know make sure we were always on the same page and again came from our relationship of one of our other employees who had worked with them in the past. So I think we had some pre-knowledge and confidence in their capabilities in what they could do and what we could do so. Mike: It’s very much a team effort across the board you know. Mike: With a small company you have to leverage every asset you got and those little intangibles can go a long way to making it happen or not happen. Steve: And in terms of quality control, is it just a set of electronic diagnostics or are there quality control aspects of the actual physical ball itself as well? Mike: All of it you know, so our app can scan every chip. You know it’s got a MAC address on it as it comes off the line and we can scan and do a little test that we designed you know just a little tablet consister [phonetic] literally scans everything that comes off the line. Mike: And gives us a real time report on it, and then when it gets over to the ball factory they have a process where they once they have sealed everything into the ball, they throw it into this bin to dry for 24 hours. We’ve got another app there that’s just scanning every MAC address to make sure it still works. And then when it gets back into the states, we ship everything here, we do a final physical check and we inflate everything with a special machinery that we invented to inflate it perfectly. Mike: And to make sure that the battery still has a charge in it because a very big thing for us that we learned that when we wanted to work out of the box, we always have to charge it to work. So one of the big things about our product is you pull it out of the box and you put it on the charging pad its wireless charging, and it turns on and you’re ready to use it within 30 seconds of pulling it out of the box. There is no pre charging required, so to innovate that process we had to think of all these little steps to make sure that not only did it work when we ship it out, but it’s charged and it’s going to come out in just two seconds you pull it out, plug it in, plug in the charging pad and put on the pad and off you go, you’re ready to play. Steve: Nice and why was that such an important factor for you to have the battery charged upon opening? Mike: Well it’s such a new product and we– and people had never experienced it before and we didn’t work with other smart products for example Nike basketball shoes or whatever. And almost all of them require this setup, this 15-20 minute of trying to figure it out, and in our market its not necessarily the most tech savvy you know these are these are people that just want to play. Mike: They want to start and the anxiety level that builds up with the new tech product that you’ve never used is very-very rapid. Every minute that you make them you make your customer try to fiddle with something. So we say let’s design a product where it’s so easy to pull out of the box, take one step you know you’ve already got your app downloaded, dribble it four times, it’s going to connect and off you go. And that was it was very important to us to make the success of the product from the customer’s prospective, the momentum after sale, that’s why we did it. Steve: Yeah that actually makes complete sense now that I think about it a little bit more. I would image people who are tech adverse if the ball is not ready to go right off the bat they might think it’s busted or something as well, right? Mike: But we kept it at a very minimal range manageable range and your customer service and how you replace and get people up and running is very critical. So we had all that planned out and it’s all very practical. Steve: Okay, and then you know just this question mainly for the listeners, you know for an aspiring entrepreneur that wants to create an incredible physical product that involves tech, what advice would you give just you know from a starting standpoint. What would you focus on initially? Mike: Oh, so, ask me that again Steve, and you could edit out the first one, let me make sure I understand that question. Steve: Okay so you know, this is actually a question for me for the most part because I’m very interested in tech and you know physical hardware products. So for an aspiring entrepreneur that wants to create you know this kind of marrying of physical product with tech, there’s just so many directions you can go when you first start out. So what would you focus on when first starting out you know in terms of establishing the team and in terms of defining the product? How’s that? Mike: You definitely need a team, you need– it’s not a one man job for tech. You need some very smart founders in the business that are multi-facetted and that can think in a couple of different ways, business, strategy and tech. So that I think that’s first. Don’t be afraid about the things like whether somebody is going to steal your idea you know if you get bogged down with those things– the whole key is get through the green lights you know imagine yourself driving down the road and you’ve got to get to the airport, you’re about to have a child, you’ve got to get to that hospital you know. So you have to get there, and it’s all about speed, so if you get caught at a red light or get slowed down by yellow it’s bad. So sometimes you’ve got to shift out of a lane that you think you need the green, leave and just to get to that green light, you’ve got to get through the green and that’s got to be the philosophy you have. But then the second thing is if you have your team and you are comfortable and the chemistry is there and you know you’ve got the right vision, getting to the customer and really understanding that you are on the right path and making those adjustments is so critical, and I mentioned before we started talking that we have large companies coming to us now saying can you help us build a product like this for a different form factor or a different space. You know what you’ve done is that innovative, and we give the same advice to them as yes not only can we do it, but we can do it fast but fast means we’re going to take you to the customer from day one because you have to get the experience right. This new wave of products where I think many are failing in it is that they think data in it of itself is the answer and it is not. I think what the customer is going to want and we’re seeing it today and we’re going to see it more and more is give me data that is usable that, okay I get the number but what do I do with it, what’s the next action I take so that I can see some improvement in the thing I’m passionate about. And understanding those connections between data and actionable contextual kind of feedback, something you can use is critical and the only way you can get it is to get to a customer with a real prototype. So build your prototypes fast, get to your customers fast, fail fast, and go back and try it again. Mike: Over and over again is the real key to it, and if you can do that and do it efficiently then you have a chance of winning. If you can’t or you avoid it, I pretty much guarantee you are going to lose because you’re going to end up with a product that looks just like everything else or worse. Steve: And then along the way gather emails and contacts and establish your social stuff so that when you’re ready to launch, you already have a following. Mike: Well absolutely. Every person you talk to is going to know about 1000 others. So you know you’ve got to win them even if it’s an early prototype that they buy in your vision and they’re willing to talk about it to their next 1000 people, and you try to collect and build that every step of the way so that if you get to a point where you’re trying to do a kick starter or something like that, you’ve got that asset ready to leverage, and it is an asset that’s a very valuable asset. Steve: Okay and then in terms of doing the kick starter, will that be something that you would definitely do again? Mike: It depends on what we were– what the goal was, so you know if I was starting a new company with a new product yes. Mike: For our company today I don’t think we need it because it satisfied what our goal was and we’ve got all the things that give it its own momentum now, so we’re sort of beyond that, we wouldn’t use it again for this company. But if you are starting if I was starting a new company yeah it would definitely be in my launch plans. Steve: Okay cool, hey Mike we’ve already been talking for 45 minutes and I want to be respectful for your time. Where can people find out more about your ball and perhaps even contact you if they had any questions about your product? Mike: Yeah, the best place where we have by far the most information is 94fifty.com and that’s the number 9 and number 4 and the word fifty spelled out 94 and F-I-F-T-Y and just a ton of great information there, that’s about the product. Our company website is informotionsports.com and that’s more of a broader strategic kind of website, you can learn more about us you know we’re distributed as I mentioned kind of all over the internet whether you go to Amazon or Dicks online or wherever, East Bay, but they’re all going to point back to the information we have there, and you can find out how to contact us directly from any of those sites. That would make it pretty easy for people to access us and we’re trying to be as responsive as we can about responding to everybody either as a question or a concern or whatnot, a piece of feedback. Steve: Okay well hey thanks Mike for coming on the show; I know you’re busy man and I really appreciate you coming on. Mike: I appreciate you having me, thanks Steve. Steve: Hope you enjoyed that episode. Mike’s company 94fifty.com is one of the coolest companies that I have seen in a while, and I’m definitely going to get one of those basketballs for my son after all he’s going to be the next Jeremy Lin, count on it. For more information about this episode go to mywifequitherjob.com/episode51, and if you enjoyed this episode please go to iTunes and leave me a review. When you write me a review it not only makes me feel proud but it also keeps this podcast up in the ranks so other people can use this information, find the show more easily, and get awesome business advice from my guests. It’s also the best ways to support the show and please tell your friends because the greatest compliment that you can give me is to provide a referral to someone else either in person or to share it on the web. Now as an added incentive I’m always giving away free business consults to one lucky winner every single month. For more information go to mywifequitherjob/contest, and if you are interested in starting your own online business be sure o sign up for my free six day mini course where I show you how my wife and I managed to make over 100k in profit in our first year of business. Go to www.mywifequitherjob.com for more information and thanks for listening. This thing is cool!! I’m not a basketball player, but the technology and feedback loops are amazing. I thoroughly enjoyed the discussion on the “out of the box momentum” and product use, it definitely gave me food for thought.